Occasionally, we may want to cut a specific part of a video from a large file. The best way of achieving this is by using a video splitter software. Splitting can take a lot of your time since many video splitting programs are slow and not user-friendly. It is important that you use high-quality video splitters for efficiency. This article will focus on six best video splitter software that can help you to split your videos easily and efficiently. This is one of the best video splitter software that is convenient for beginners and professionals. It supports a wide range of audio and video formats such as MPEG, AVI, MP4, WMA, VRO, M4V and many more. The software is fast and one can preview results before finalizing the split. Joyoshare Media Cutter also preserves the original quality of the file even after splitting. The edited file is compatible with any device including Android phones, iOS and Smart TVs. It ensures that users have control of the finer details so that their preference can be preserved. Joyoshare Media Cutter works at sixty times faster speed, which means that you can complete a 60-minute file in just one minute. This a free video splitter that can cut, encode and filter parts of a video. It allows the user to adjust the contrast, brightness, and saturation of the video. Avidemux also supports popular input and output formats such as MPEG, AVI, 3GP, MPG, MP4, and many others. It has well-laid functions and controls that simplify frame by frame navigation. Users can easily access recent projects and files by clicking on the Recent menu. 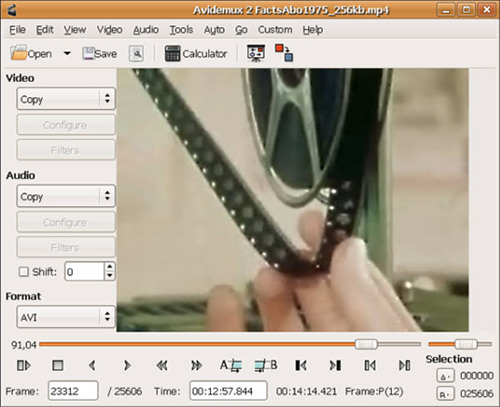 Avidemux allows you to reduce noise, add subtitles, and smoothen the image. The program works with Windows 7, 8, 10, Vista, Windows XP, (except 32-bit), macOS and Linux. This user-friendly video splitting software gives users full control over the whole chopping process. It is aesthetically appealing and has a big preview window. Easy Video Splitter allows users to simply select the end and stop points of their segments by clicking two icons. The main highlight of this software is that you can chop several clips from the same file. This feature is not found in many software. Easy Video Splitter can automatically split videos by time and size. The trial version allows users to split an unlimited number of files for a whole week. It is convenient for amateurs and does not need any technical skills. It supports several formats such as MPEG, AVI, ASF, and WMV. The batch mode can split multiple videos at a time. It is not advanced enough compared to other video splitting software. 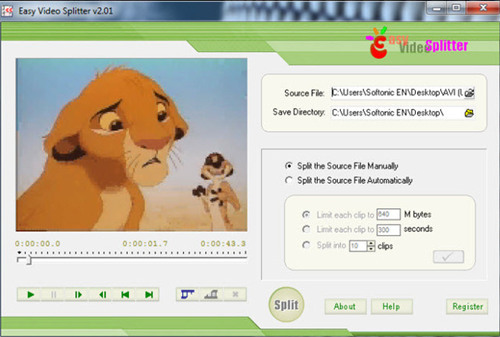 This is a free video splitter software that enables users to cut and merge videos. It supports a wide range of formats such as AVI, MOV, VOB, MP4, FLV, MPEG, Xvid, Divx, and MPEG. It allows you to chop and split files while maintaining the original quality. 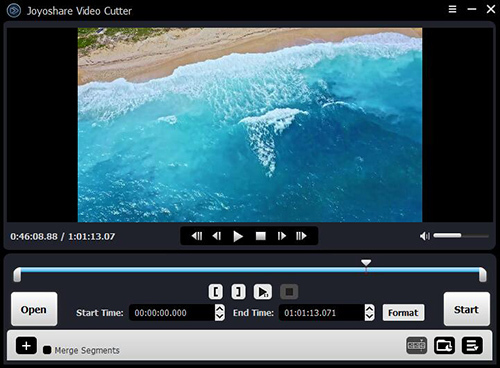 Free Video Cutter Joiner allows users to remove adverts and trailers from videos. It is easy to use and works perfectly for audio. It works with Windows XP, Windows Vista, Windows 7, 8 and Windows 10. Note that this program is compatible with iOS and Android. It can also merge videos of different formats. This is one of the best video split software today. It offers a wide range of conversion profiles. The 400 profiles enable users to play the videos on any devices. It is equipped with tools that can crop, trim and subtitles to videos. This software is free from adware since it does not have toolbars and plugins. It is able to support 1080p HD video M2TS, MKV, HDTV, and BDAV. It can convert MP4, AVI, MPEG, 3GP, TOD, H.264, and many others. It enables users to optimize the quality of the images by utilizing the built-in De-interlacing Engine and High-Quality Engine. It is important to note that this program can be challenging to first time users. This is a version of the Machete software that basically chops and joins videos. It is simple to use and also mobile friendly. Unlike other heavy editors, this program is quick and powerful. It also allows screenshot saving and Audio Stream replacement. Apart from videos, Machete Lite can also edit audios. Machete preserves the original quality of the audios and videos since it doesn't re-encode files. The clipboard functionality saves time and allows users to focus on editing without consistently saving their changes. These are the 6 best audio video splitter software today. However, there are things one should consider before choosing a video splitter. One should examine the functionality by checking all the features, cons and prods. Also, you should check the supported formats since videos have different formats. Be sure to check the stability and the price of the software on the web. We recommend that you try the Joyoshare Media Cutter if you care about the quality very much.